An Iowa group has released a comprehensive white paper, “Food Waste in Iowa: Recommendations to Position Iowa as a Leader in Reduction and Recovery” examining Iowa’s position and role in food waste. 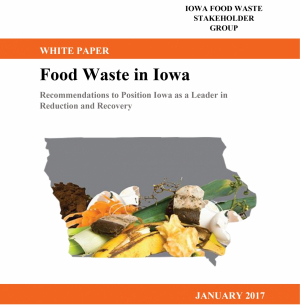 In 2015, the group determined a white paper would be developed as a means to introduce where Iowa stands and how we can move our state to become a leader in food waste reduction and diversion efforts. In 2016, funding was granted from the Iowa Energy Center to fund paper development. The stakeholder group also collaborated with the Law School at Drake University for students to conduct research on existing laws and regulations regarding the handling, distribution, and disposal of food waste; additionally, coordination of the content was facilitated by Eat Greater Des Moines. The result is “Food Waste in Iowa: Recommendations to Position Iowa as a Leader in Reduction and Recovery,” a 26-page report that outlines the six actions of the U.S. Environmental Protection Agency’s Food Recovery Hierarchy and provides detailed suggestions for implementing food diversion tactics throughout Iowa communities. Over 20 Iowans from many facets of government, business, non-profit and other organizations make up the Iowa Food Waste Stakeholder Group, which developed the white paper report to get a comprehensive look at the current food waste situation in Iowa and set recommendations to lead Iowa towards becoming a national leader in food waste reduction and diversion efforts. The 26-page report outlines the six actions of the U.S. Environmental Protection Agency’s Food Recovery Hierarchy and provides detailed suggestions for implementing food diversion tactics throughout Iowa communities. The white paper can be viewed at iwrc.uni.edu/iowa-food-waste-group and hard copies are available upon request.